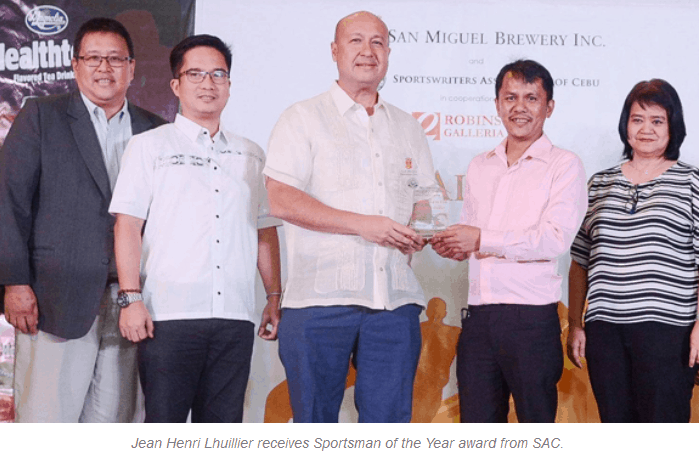 JEAN Henri Lhuillier, President and CEO of PJ Lhuillier Group of Companies, was awarded Sportsman of the Year in the 36th Sportswriters Association of Cebu Awards. Lhuillier was recognized for his efforts in sports grassroots development and support to national teams in softball and tennis in the country. “This is a recognition that I do not take lightly; it encourages me to continuously do my part in bringing glory to Philippine sports,” said Lhuillier, who is also the President of the Amateur Softball Association of the Philippines and the Unified Tennis Philippines. Lhuillier addressed athletes and encouraged them to “dream big, to not be afraid to be great, to dare to do seemingly impossible things,” firmly believing that Filipinos have what it takes to be at par with the world’s best. Lhuillier is the man behind emerging local tennis legends Treat Huey and Ruben Gonzales, who currently represent the Philippines in some of the world’s greatest tennis tournaments, including the 2016 Olympics. The newly-minted Sportsman of the Year also inspired the successful run of the PH Blu Girls, the country’s National Women’s Softball team last year. Resolute on his belief and support on the skills and hard work of Blu Girls, Lhuillier threw his support to the Blu Girls as they conquered softball powerhouses like Canada, China, Australia, Chinese Taipei and Mexico in the World Cup and Canada Cup 2017. This culminated with a silver finish at the Asian Women’s Softball tourney in Taiwan. “I’m both elated and proud to tell you that our National Women’s Softball team, the Blu Girls, have a more than a decent chance of qualifying (for the 2020 Olympics). They showed tremendous competitiveness and fighting spirit during last year’s international competitions,” he said, vowing to give the Blu Girls all the support they need, while on their way to the 2020 Olympics.